Cool breezes are bringing Halloween closer, and imaginative Halloween porch decorations will add excitement to your celebrations. 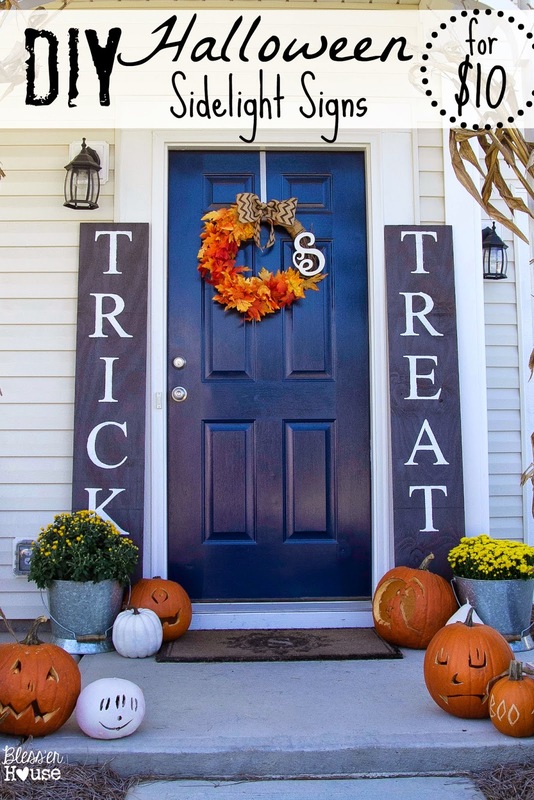 You can have a lot of fun doing your bit to delight neighbors and trick-or-treaters as well as those scrutinizing the neighborhood to select their favorite decorations. During your busy lifestyle, you might think it takes a lot of time to construct a Halloween decoration and avoid it even though you wish you could create one. 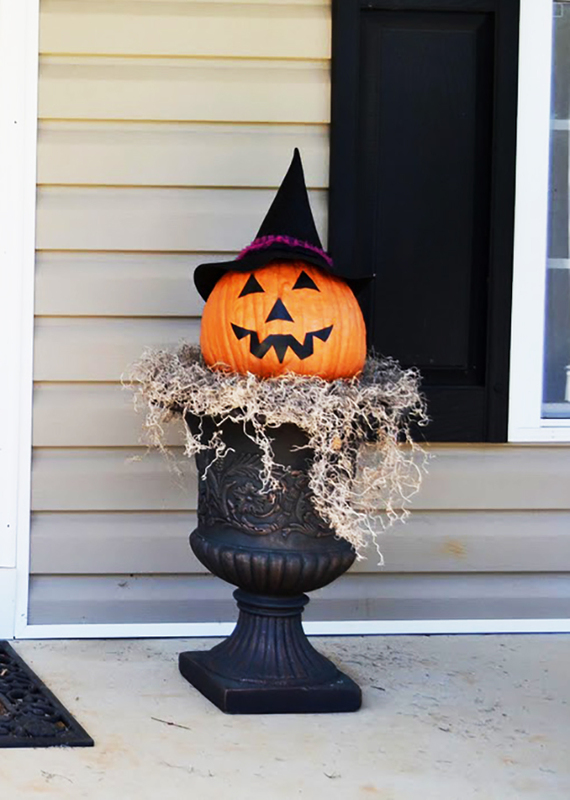 However, it is not a complicated process, and putting a simple decoration on your front porch will let your neighbors and trick-or-treaters know you want to participate in the Halloween fun. Whether you love using what you already have and are ready to look around your home for interesting items or you want to shop for fantastic offers in craft shops, you can create a unique front porch decoration. If you don’t know where to start, here is a list of 50 suggestions to make your decorating easier this year. If you have kids at home or you are expecting a lot of kids to stop by, this spider web overflowing with poisonous toxic critters produces a lot of scary excitement. It is easy to build the spider web by tearing holes in white sheets and strategically placing black spiders on the web. You can get different types of black spiders online or at a craft shop. 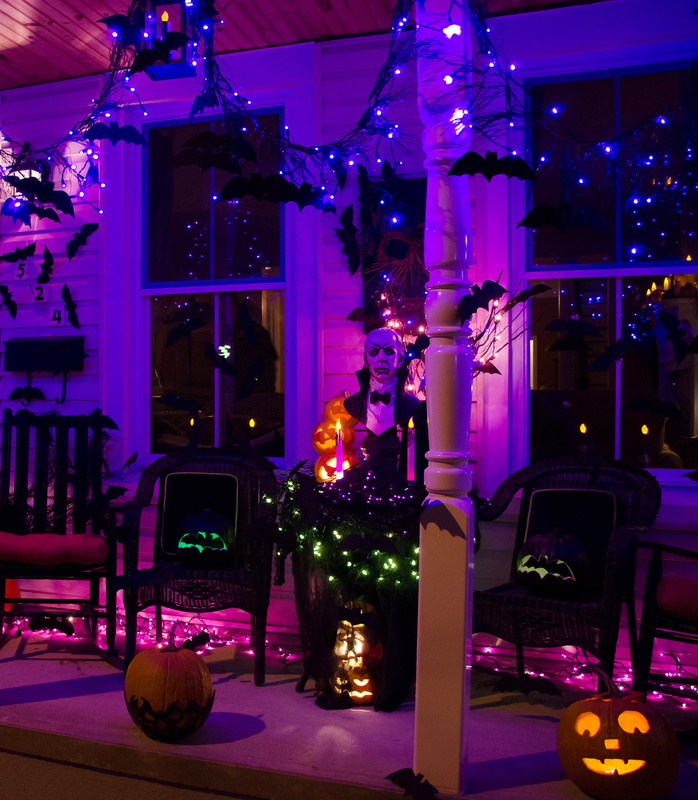 Reduce the lighting on your porch, or discover if you can cover your bulbs with transparent film wrap to increase the creepiness of the scene. Adding a pumpkin with a scary face enhances the effect. 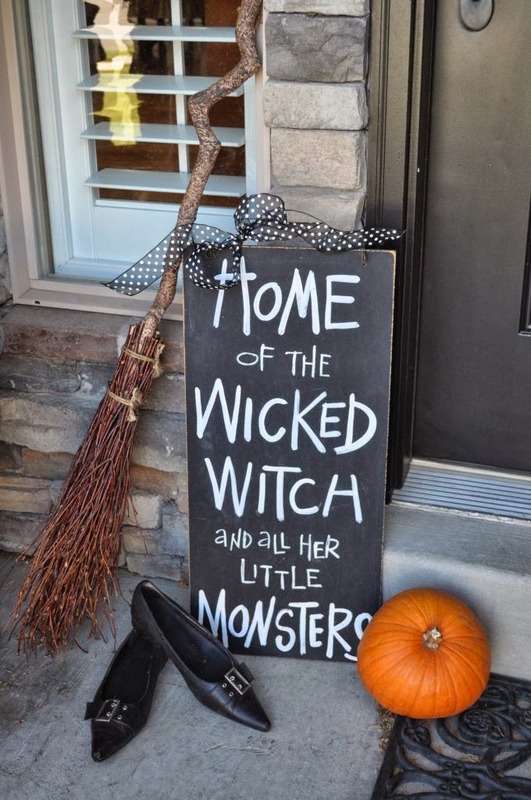 This is a simple Halloween porch decoration, but it makes a very clear statement. A creepy, vintage signboard is a classic yet scary feature. The black pointy shoes and broomstick are unmistakable symbols of witchcraft and spells. If you just have an evening to plan your porch decoration idea, this is a great option. You can change the sign to something that suits your taste such as “Little children are needed here!” Or even better, write a chilling poem for the occasion. With a simple bat template, you can cut out these realistic looking bats. If your ceiling allows, place branches across and hang the bats from the branches to give an even more realistic night-time scary appearance. The two brooms in the corner let you know whose house it is, and the presence of bats could mean Count Dracula is visiting. 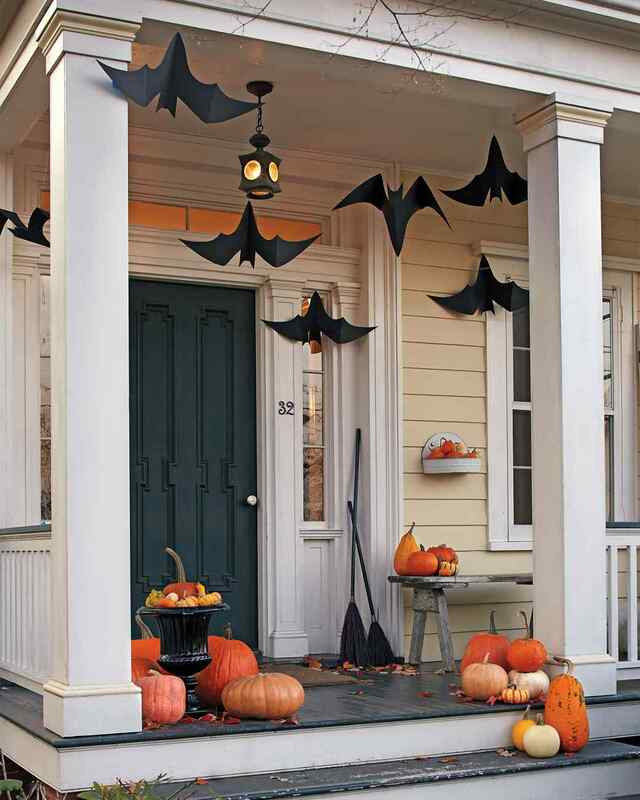 Placing an array of pumpkins on your steps or porch in different sizes and colors adds to the Halloween theme. Draping some shiny cloth with sparkles and placing a light behind it produces an awesome effect. You can place any kind of shape on top by cutting out Halloween motifs of your choice out of cardboard. These skulls have a floral design painted on them and the eyes become the background color at night giving a blood curdling thrill. 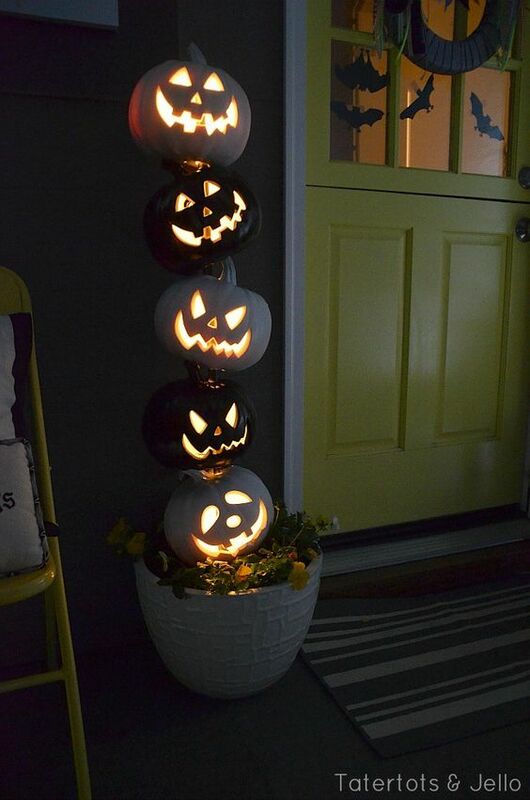 Complete the look with decorative pots filled with pumpkins. The best aspect of this design is that it looks good during the day and spooky at night. If Halloween is all about carving pumpkins for you, then buy a few pumpkins in various sizes and unleash your creative side. Whether you are looking for humor or thrills, show off your carving skills and create an attention-grabbing display of traditional Halloween fun. It is amazing what you can do with a piece of wood and some paint. In this design, the sign brings your attention right to the point. Add your own personality by designing and placing a sign by the door. 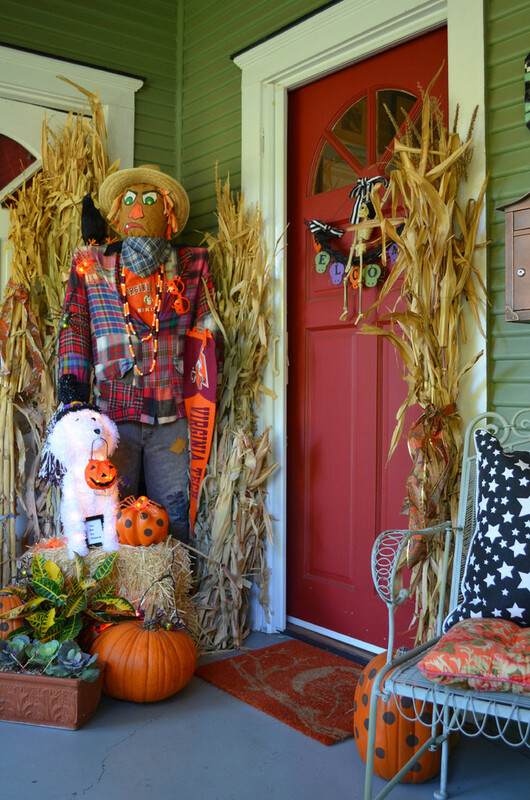 A wreath of corn stalks provides the perfect frame for Halloween porch decorations. This is an unusual porch decoration idea, and it is almost beautiful when you see the outline of the black branches and the ravens perched on them against the white paint of the house. However, at the same time, you get the eerie feeling of ravens crying through the night sky. 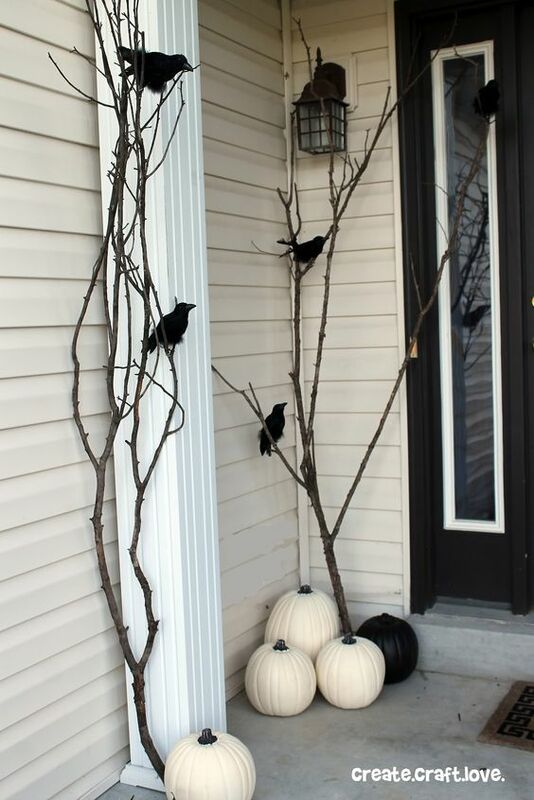 Branches from your yard work great for this and instead of carving pumpkins, just paint them black and white. Online stores and crafts shops carry ravens. You definitely still get a scare without the orange pumpkins with this DIY Halloween decoration. This is an attractive set up and always brings a wow on the face of the person who sees it, and that’s because it is creative, funny and showcases Halloween design in a very traditional way. Here you see black and white pumpkins carved with laughing evil faces. By having a center post and making a hole in the top and bottom of each pumpkin, you can create a pumpkin topiary with any theme you want. You could wrap them in black yarn to look like they are covered in cobwebs and spiders or paint them white and light them up with clear lights to look like a crystal chandelier. Needless to say, this is a popular design with kids and adults alike. 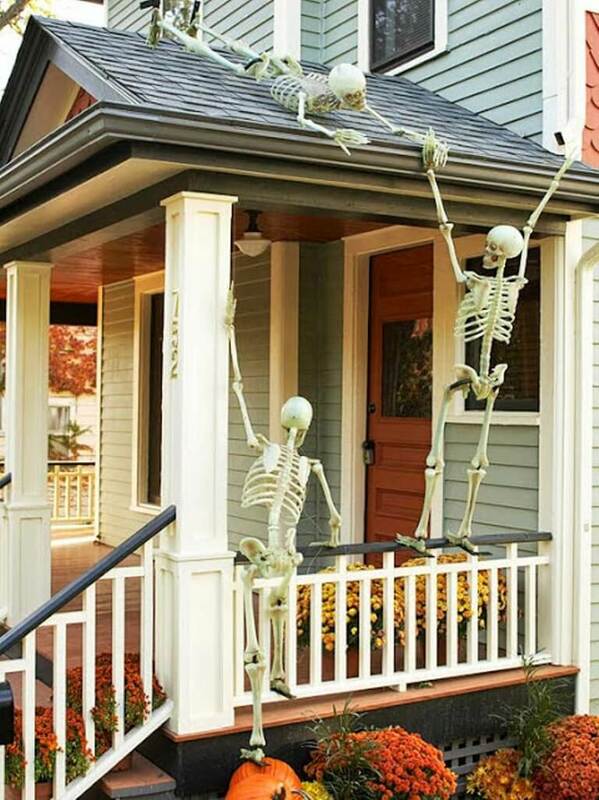 These skeletons are climbing over pumpkins and onto your roof, and you don’t know what they’ll get into next. 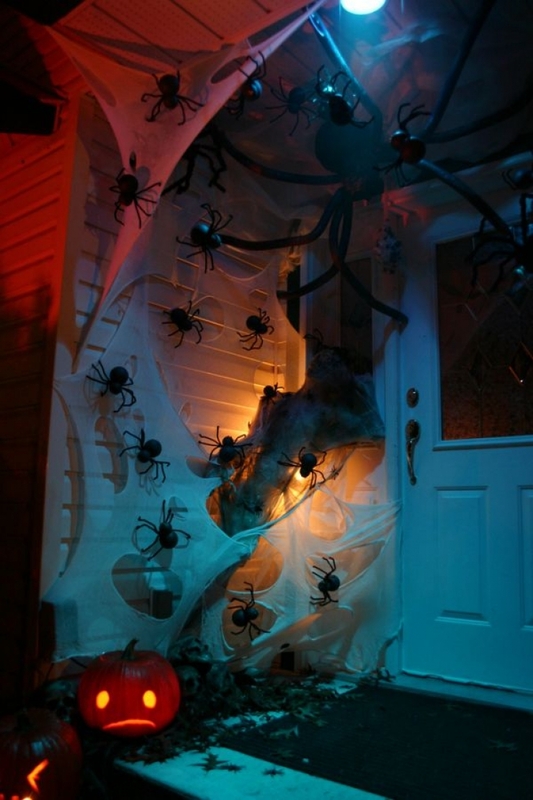 A fun aspect to this Halloween porch idea is that you can change it every day and think of different scary or funny things for the skeletons to do. Surprisingly, these skeletons don’t cost too much online and because they are strong, you can use them again and again. This is an incredibly clever idea. Some mannequin body parts with your imagination and you can see how the possibilities are endless if you wanted to change it in any way. Feet in a pair of shoes on legs covered in stripped tights glued to a board stuck in a plastic urn from Home Depot. The idea is simple, but the effect is truly awesome. In this picture, the urn is painted with a granite textured spray, but a silver plastic garden urn would do. Every family member can get involved with this DIY Halloween decoration. Find dad’s old colorful shirt and place a large coat hanger in it, and fill his old pants with crumpled newspaper to create a shape. Then a ball for a head with a painted face and a hat completes the look. It appears hard to do because the final result is so effective, but once you start giving structure to the pants and shirt, you’ll see how uncomplicated it is. Your kids can have a lot of fun decorating it. Whether they want to cover the scarecrow with spiders or make him look like a beach bud, the process is just as fun as the final outcome. A seemingly complicated creation. However, drape some of your left over Christmas lights and place some eerie light on the floor as well as in the background, and you can make this magnificent display. Consider using transparent film wrap instead of buying new lights. All it needs now is a selection of bats, carved pumpkins and fearful looking people or creatures hanging around. You can buy Halloween characters dressed for the occasion or put a new face on the dolls and stuffed animals that you already own. You can do this by cutting out strange shaped eyes, ears, nose and mouth from colored paper. This is a good option for those who want to participate in the fun but don’t have time for an elaborate set up. The plastic urn comes in handy again, and you can place a board across the top and put some straw for the base of a dressed up pumpkin. Place this on one side of your door and try another decoration on the other side, maybe the witch in the urn? 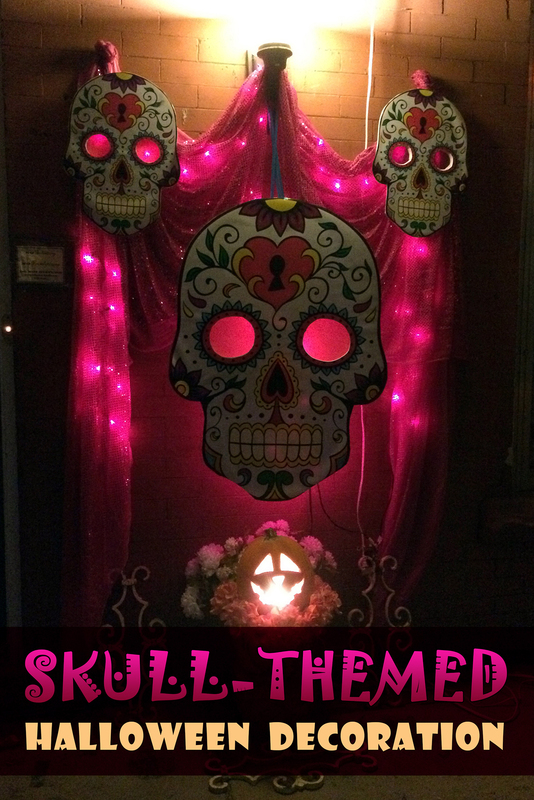 If you want to keep it simple but also scary, you could turn the straw and pumpkin into a bones and skull display. These ghosts aren’t terrifying; in fact, they are kind of cute. Imagine how much fun you could have making these little guys and placing them in different places. 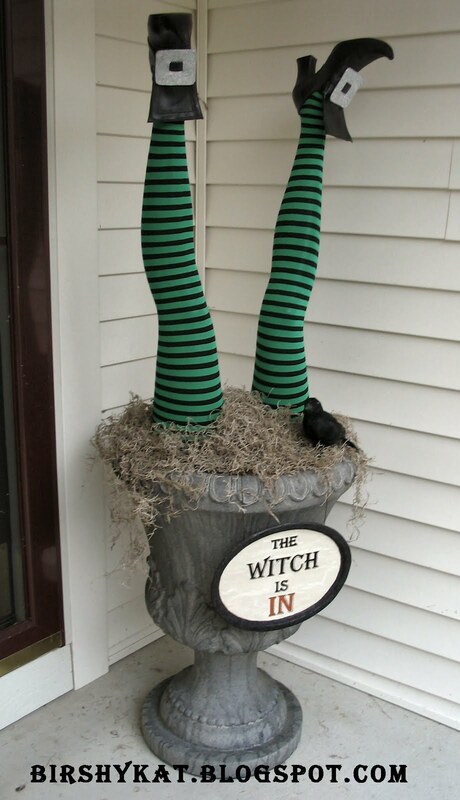 They are a great Halloween porch decoration by themselves, but you can add them into other creations you are designing as well. 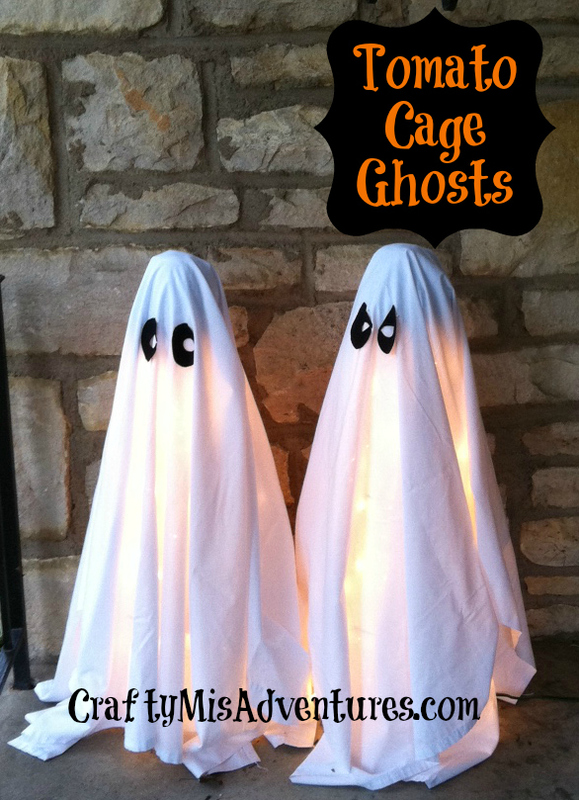 These are made with a tomato cage, white sheets, black felt for eyes and white lights. You can stick a ball, or something round, on top so their heads aren’t flat. This is a very easy DIY Halloween decoration to do, and the result is a simple but fun Halloween presentation. 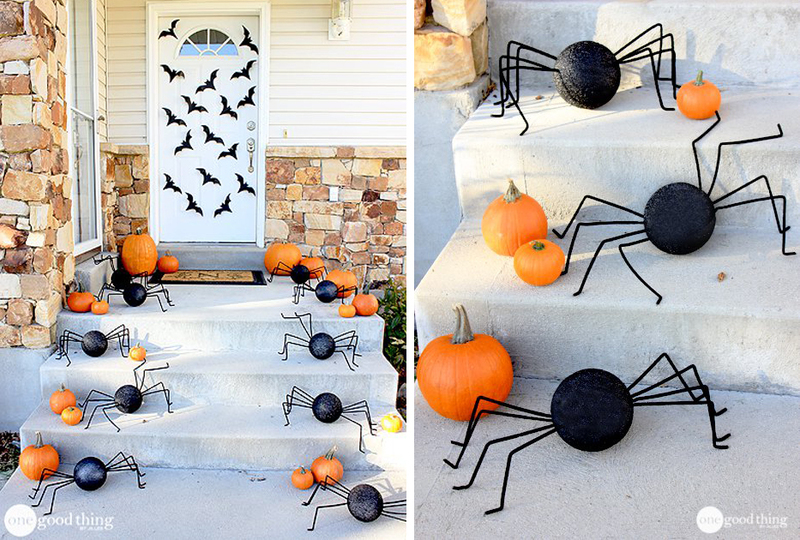 You can make more spiders and bats and make it look like they are invading your entire home. Black poster board for bat cut outs, and Styrofoam balls, black paint and pipe cleaners for spiders is all it takes. Pumpkins in different sizes falling down the stairs complete the look of a Halloween critter invasion.